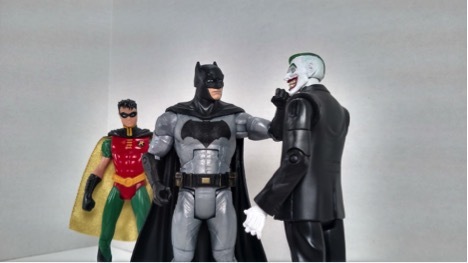 Today we will be looking at The Joker from the new Multiverse line. The figure comes in the new style of box that all the 6-inch Multiverse figures will be using. With this line they will be mixing Comic, Movie and TV characters. You have the DC comic’s logo in the upper left with The Multiverse logo right below it. The figure is clearly displayed in the box with a picture of The Joker and the name of the figure listed below. The back of the box lists a quick bio on what the line is all about. The rest of the figures to come out in this 1st wave are listed on the left (Batman, The Joker, The Arrow, Superman (Earth 2), The Flash and Reverse Flash). On the right of the box is an image of the COLLECT AND CONNECT Justice Buster. The side of the packaging features another picture of The Joker with some stats on the right. On the left you have the Multiverse logo and the DC Comic’s logo. 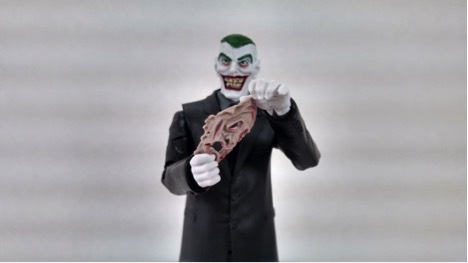 The Joker comes with the left arm for The Justice Buster; we will take a closer look at them when we complete the COLLECT AND CONNECT figure! He also comes with his old face he cut off at the start of the New 52. The Joker stands right at 6.5 inches. The sculpture of this Joker figure is awesome. The extra movement in the arms due to the bicep cut allows for a greater variety of positions. I also really like how the face looks. It looks just like it did in EndGame, plus it’s also creepy as can be. It’s a little hard but you can get him to hold the face. 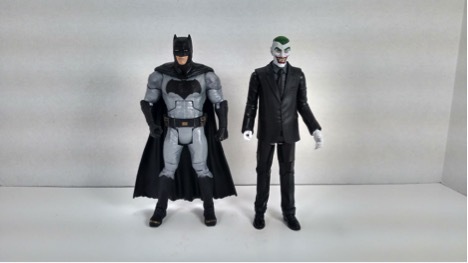 Here is The Joker standing next Batman from the Batman v Superman line. So that’s my review on The Joker. I have to say that I love the figure. He has all the articulation I wish the other figures would have. It’s also very different to see the Joker in a suit. He also has the little details I look for, like a little bit of green still on his head where it was buzzed off. Good job on this one Mattel.